Some months ago, I got in my head that I wanted to learn how to make Bolognese sauce from scratch and was pleased to find it’s not nearly as difficult as it sounds. This Tyler Florence recipe is excellent. I substituted Italian sausage for ground beef and pork since that was all I had the first time I made it, but now I actually prefer it that way. I also nixed the bacon, but feel free to add it back in. Purée the onion, celery stalks, carrots, garlic, together in a blender (Tyler says to purée, but I chopped for a chunkier sauce). In a heavy-bottomed pot add olive oil, bay leaves, herbs and cook gently until fragrant, then add vegetable purée and continue to cook for a further 5 to 10 minutes. Raise the heat a bit and add the sausage; brown until the meat is no longer pink, breaking up the clumps with a wooden spoon. Add the milk and simmer until the liquid is evaporated, about 10 minutes. Carefully pour in the tomatoes, and wine and season with salt and pepper. Bring the sauce to a boil, then lower the heat and cover. 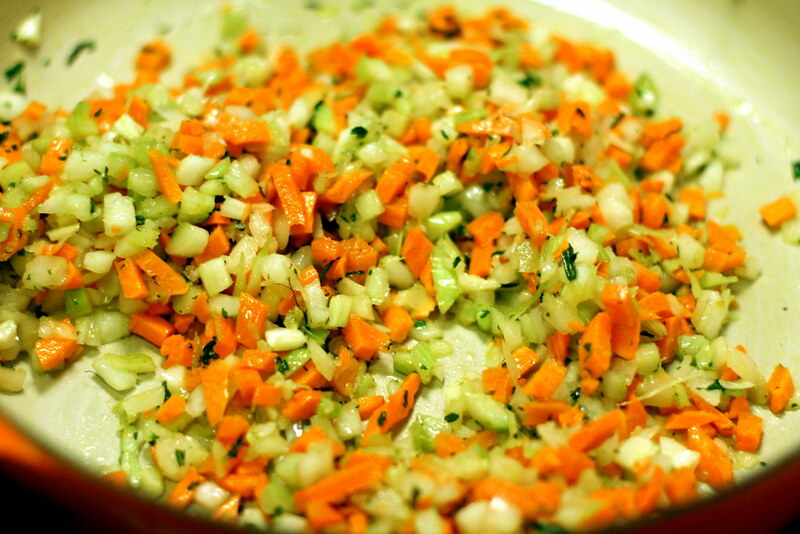 Slowly simmer for 1 1/2 to 2 hours, stirring now and then, until the sauce is very thick. Taste again for salt and pepper. 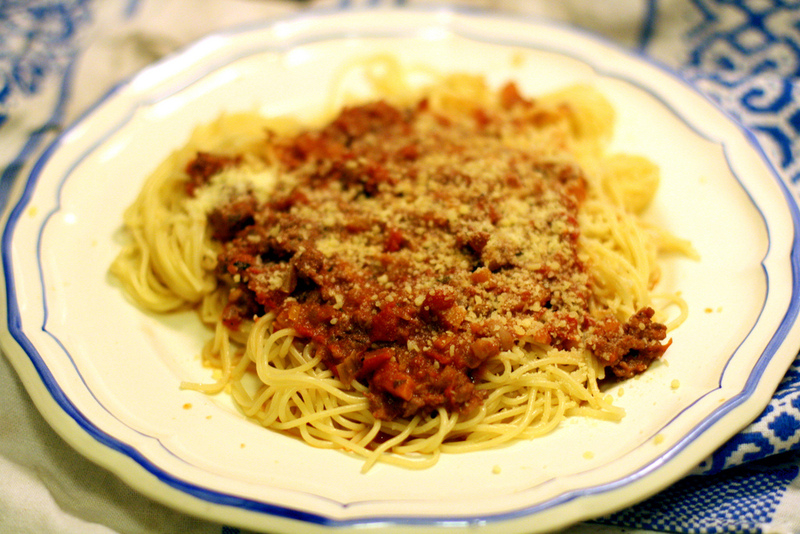 Serve with pasta of your choosing, freshly grated Parmigiano-Reggiano, and enjoy! I love bolognese sauce and my favourite recipe is by Jamie Oliver but I'll try yours – looks delicious! Ohh Italian sausage is a brilliant alternative! you know I love it that you're talking food around these parts. It doesn't hurt that your photos are beautiful either! Nixed… the bacon?! Good for you! Haha, this looks sooo delicious. 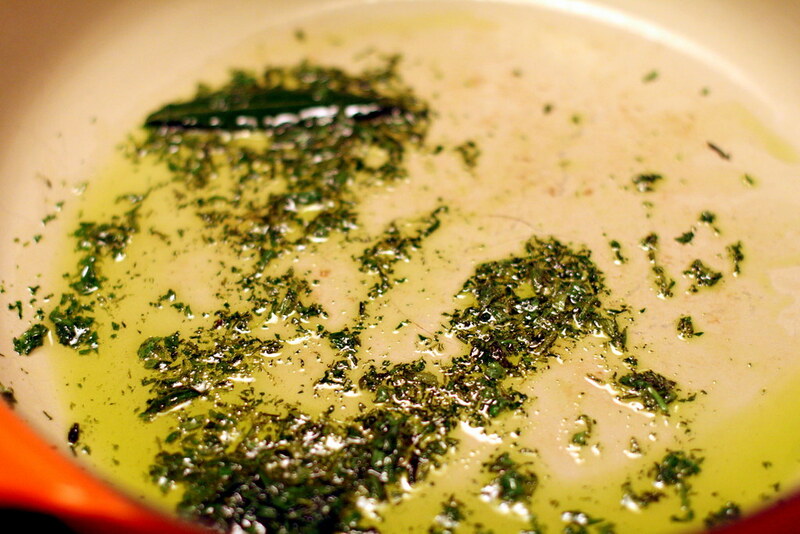 The herbs cooking in oil look mouth-watering. It sounds simple and looks great. looks yummy! good for you for learning to make it. i stick to the southern recipes my dad and grandmother have fed me my entire life. i really should branch out and learn something new. i love comfort food. this looks soooo delicious. You know… I could eat that.